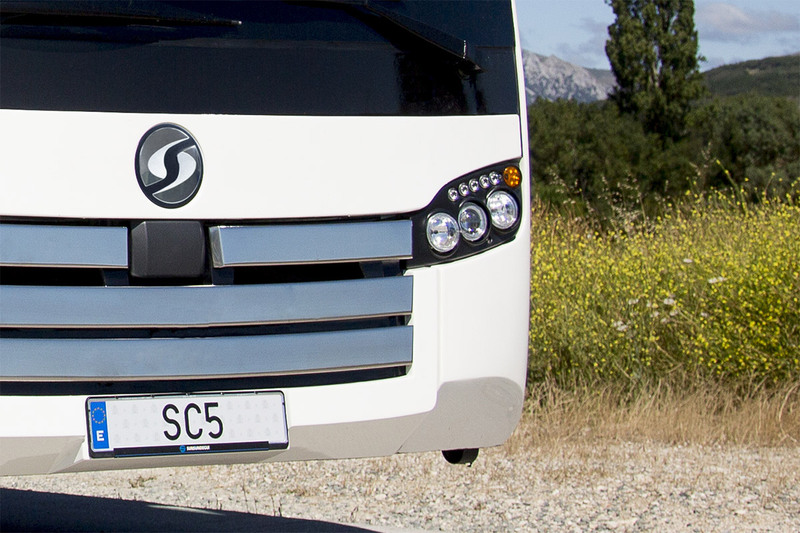 The SC5 is Sunsundegui’s most versatile all-purpose coach. Created for commuter, medium distances, school transport and business services, it is slightly lower than the SC7, although this reduction in height barely takes away space from the luggage hold, making it a very versatile, multifunctional model, that is also capable of undertaking long-distance journeys. The design of the SC5 follows from the SC7. It retains the same lines for a coordinated style that is common to all our models. Robust and elegant at the same time, it boasts a dynamic, agile look. The rear-view mirrors enhance this impression by flowing without interruption with the profile of the vehicle. They provide maximum visibility and excellent turning capability, while an anti-collision system folds the mirror in when hit with moderate force. Its front image is determined by a large panoramic windscreen with Optikool solar absorbing treatment, elegant stainless steel bands and lamps that give this model the unmistakable Sunsundegui personality. Daytime running lights and turning signals are LED, while the headlamps and fog lamps are halogen, with LED as an option. The rear lamps are standard LEDs and, like the SC7, have the same shape as the headlights, unifying the aesthetics of the vehicle. Both rear and the front lamps are interchangeable with the SC7. The design of the back is completed with the characteristic Sunsundegui engine bay cover providing ventilation optimised with the personal geometry of our models. Its modern, functional interior gives a feeling of great amplitude thanks to the shape and dimensions of its vaulted ceiling. Both vehicle access and the whole dashboard feature an avant-garde look, with long, fluid lines and more space for the guide’s seat. As it could not be otherwise, the SC5 includes the latest safety technology. 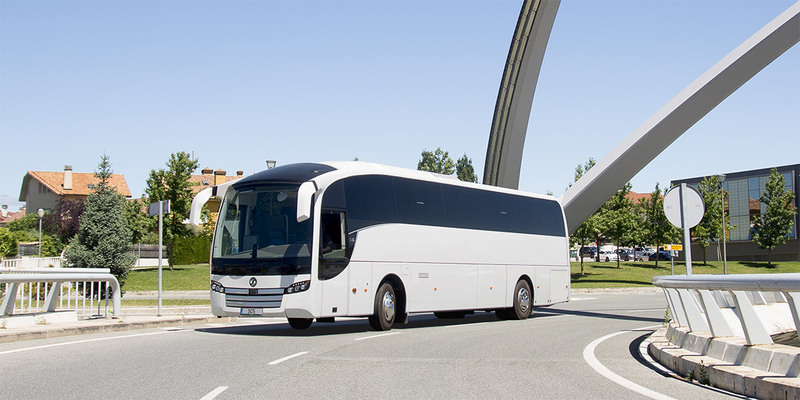 The body complies with the most stringent rollover regulations (Regulation 66.02) and has a reinforced front structure to absorb impacts that provides greater protection for the driver and guide. Interior guards have great deformation capacity for increased passenger protection in case of impact, while the front panel and bumpers are factory ready for the installation of automatic braking and lane change systems. There are various anti-trapping systems on both doors and side covers and CCTV for passenger safety is also available. As an option, an automatic fire extinguishing system can be mounted in the engine bay and extras such as an anti-theft alarm, parking sensors and Telemat are also available. 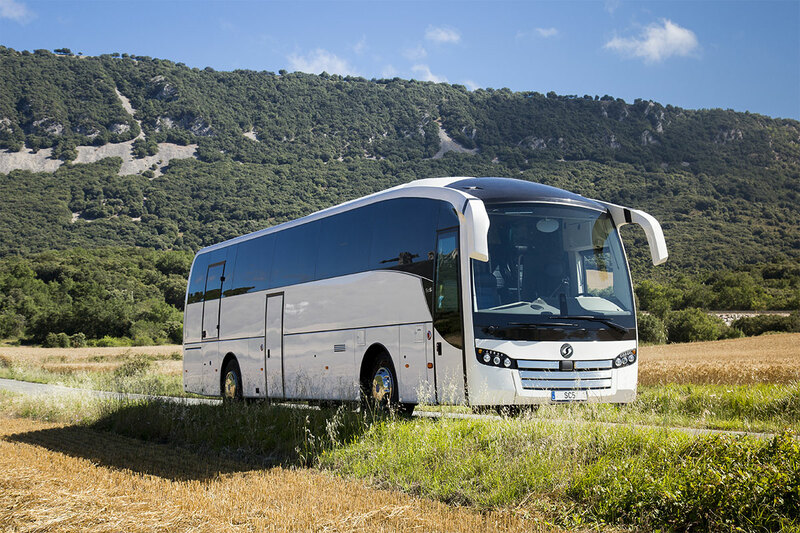 Achieving a coach that offers comfort and safety coupled with the profitability our clients expect is one of our company’s priorities. In order to achieve fuel savings, the SC5 is 20 cm lower than the SC7, which optimises aerodynamics and provides considerable weight reduction. Being a highly industrialised model, the SC5 features easy component assembly and disassembly and a good accessibility to the various installations, to reduce maintenance down time. It is easy to clean, with convenient access to front and rear lamps, spare wheel and engine bay cover. The SC5 includes an electric door, thereby achieving a more efficient system with greater operational condition diagnostic capability and failure detection. 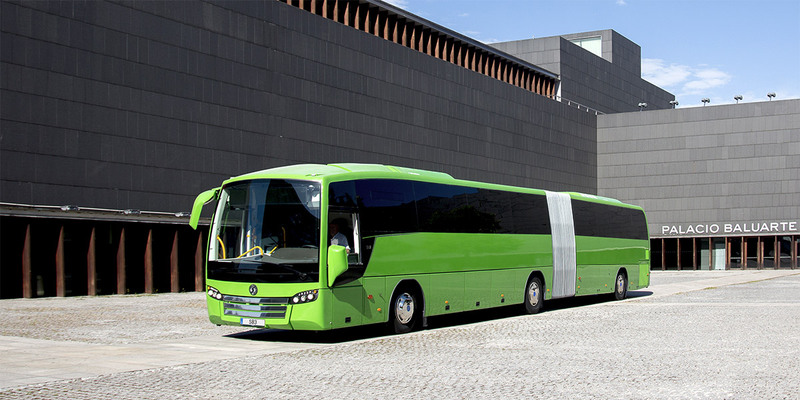 Leakage issues are minimised, as body compressed air circuits are only required for the luggage hold doors and some minor functions. 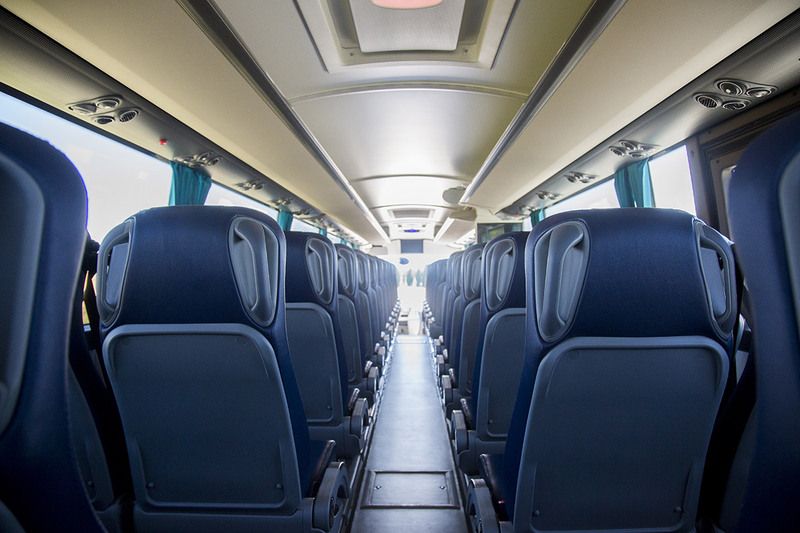 It allows the largest number of seats as it can have an overhang and, although its standard configuration is designed for a commuter bus, numerous available options can provide a high level of comfort. Additional fuel tanks can be installed to considerably increase vehicle autonomy. 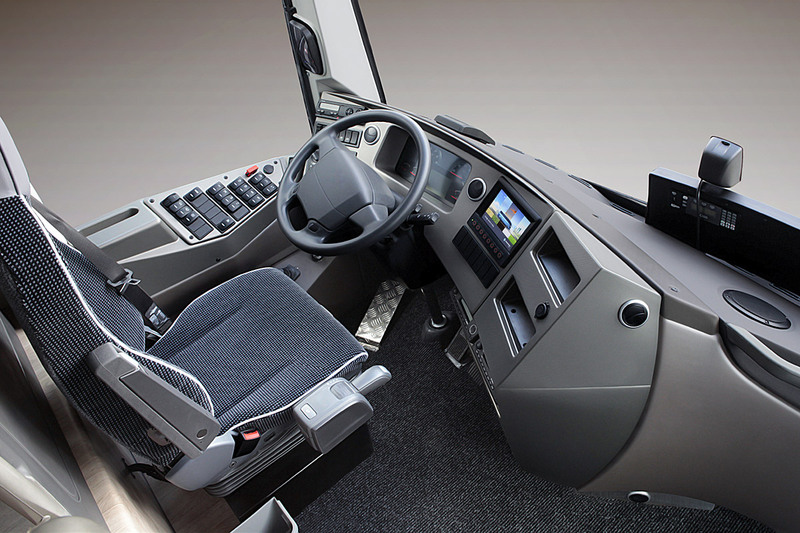 At Sunsundegui we know that it is important to create a comfortable, spacious and ergonomic driver’s area. The SC5 features a comfortable height- and depth-adjustable seat enabling easy access to controls, which are practically all grouped to the left of the driver for better, easier handling. The dashboard includes a 7-inch screen that handles different functions, including air conditioning, preheating and demisting controls, road camera displays, and electronic component inputs and outputs for maintenance and diagnosis. The SC5 is a true, effectively multiplexed vehicle. 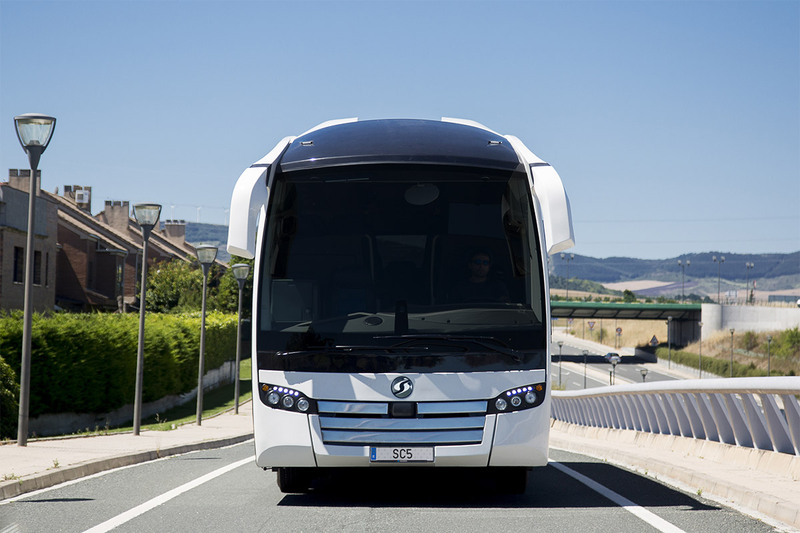 Mirrors are strategically located to prevent forced postures and ensure greater vision and the vehicle has a one-piece, motor-driven, see-through blind on the windscreen with an opaque strip at the beginning to prevent glare. The standard fresnel lens placed on the front door widens the driver’s field of vision on the right side of the vehicle, enabling safer lane changes as well as greater visibility at intersections and roundabouts. 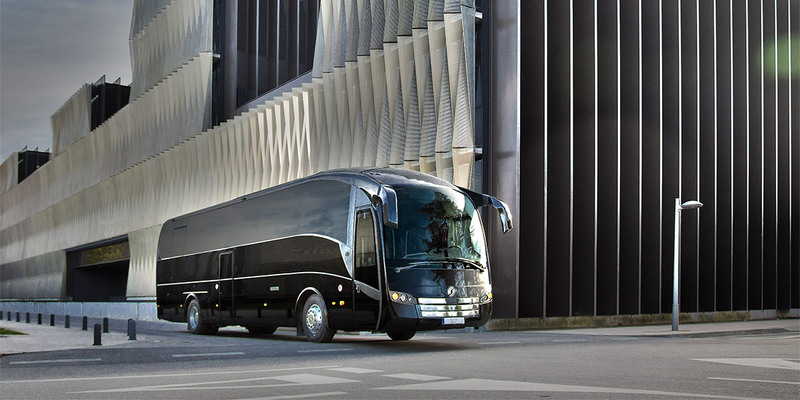 The SC5 offers passengers an unrepeatable travel experience. Its very bright, spacious interior is designed for comfort and its solid structure eliminates noise and annoying vibrations, thus providing a smooth, pleasant ride. 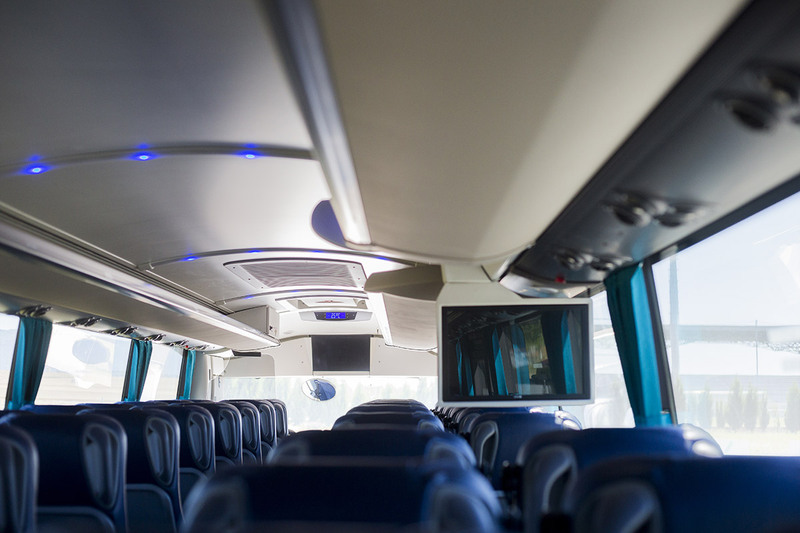 Passenger amenities include LED reading lights and individual air vents, as well as options for USB ports and 220 V sockets. SC5 standard passenger entertainment equipment includes a radio, USB socket for audio and video playback, hands-free communications, a digital amplifier and an integrated multifunction screen, with a CD and DVD player as an option. Each vehicle has two monitors (22 and 19 inches) with a third, motorised 15-inch monitor as an option. 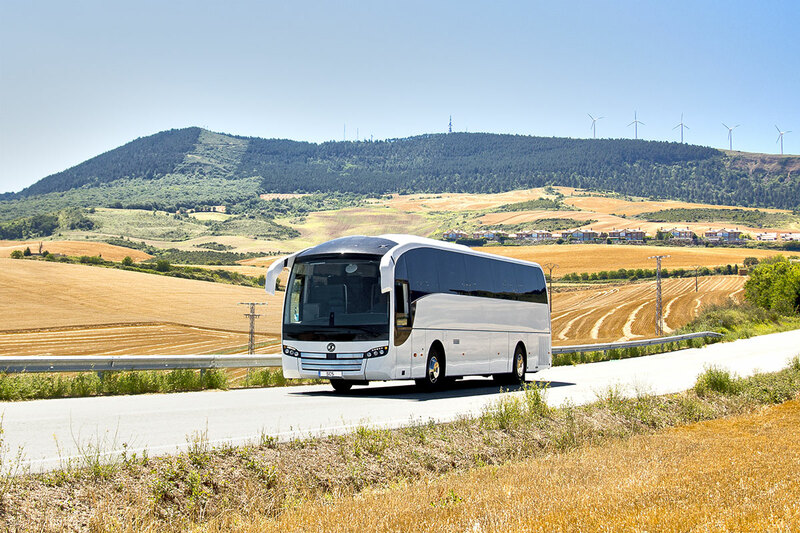 The vehicle is delivered Wi-Fi ready for on-the-road internet access. 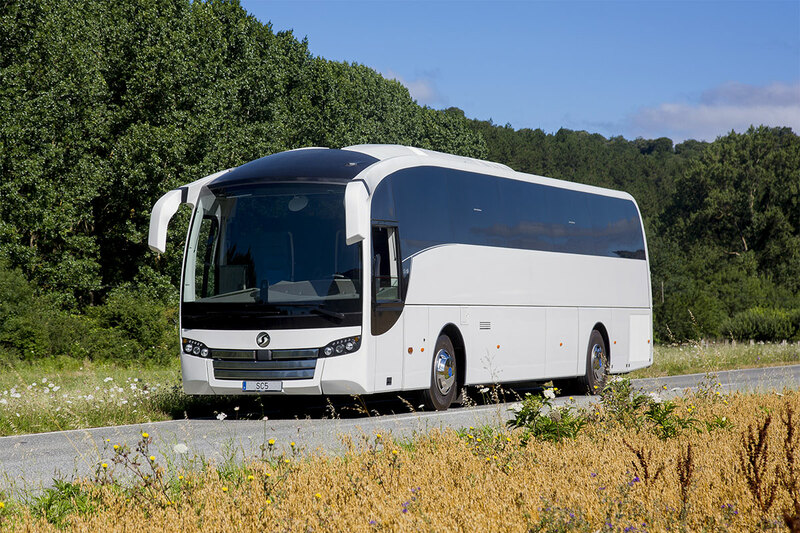 This model can include an e-control system to provide different air conditioning settings for the driver and the passengers. 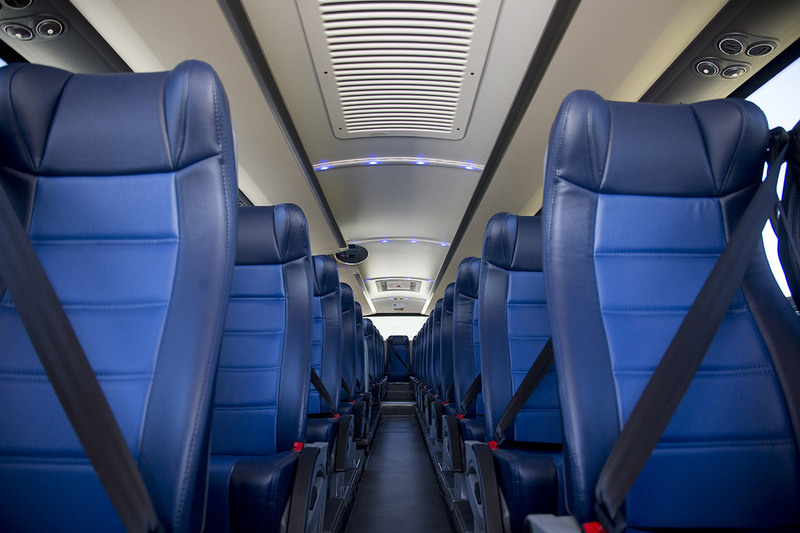 In addition, the special arrangement of air vents and internal ducts produce a ‘cold ceiling’ effect that creates, by convection, an air current that maintains a constant temperature for all passengers. The SC5 also offers a toilet as an option, both at floor and at footboard level, adapting to the various vehicle configurations. Two types of lift options are available for passengers with reduced mobility: one in the luggage hold and the other behind the rear axle in order to maximise storage space.